In 1909, Herbert Croly argued growing inequality was destroying the American dream. Do you think his argument is valid for today? Join us for Children’s Reading Hour / Cuentos en el Kiosko, 2 PM the last Sunday of the month, at the kiosk in front of Libros Schmibros on Mariachi Plaza in Boyle Heights. Children 5-10 and parents are welcome. Free. Nos acompañe para Cuentos en el kiosko , 14:00 el último domingo del mes , en el quiosco frente Libros Schmibros en Plaza del Mariachi en Boyle Heights . Los niños de 5-10 y los padres son bienvenidos . Gratis. Click here to see a video from the inaugural event, plus full details & background information. Or, click here for the Facebook Event page. Celebrating the 50th anniversary of a classic, the Boyle Heights-based lending library Libros Schmibros presents a screening of the film Tiempo de Morir, adapted by Gabriel García Márquez and Carlos Fuentes from an original story by Gabriel García Márquez and directed by the great Mexican filmmaker Arturo Ripstein, in his directorial debut. Led by Libros Schmibros co-founder David Kipen, the night begins with a discussion of the film by Director Rodrigo García (Things You Can Tell Just by Looking at Her, Albert Nobbs) – García Márquez’s son – and other special guests. Tiempo de Morir tells the story of a lone righteous vaquero who returns to his Michoacán pueblo after years in prison to reclaim his ranch and his fiancée, but cannot escape the cycle of violence that forced him to commit murder so long ago. In a scenario that anticipates García Márquez’s immortal novel Chronicle of a Death Foretold two decades later, Juan must decide whether it’s time to get out of town or…time to die. Click here to see the theatrical trailer, plus full details & information in Spanish. Or, click here for the Facebook Event page. 100% of the net proceeds benefit Libros Schmibros! 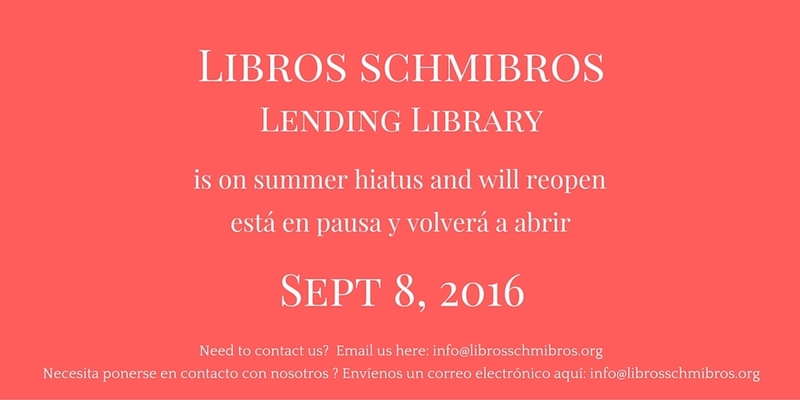 Libros is taking a much needed rest from August 15th to September 7, 2016. We will reopen Sunday September 8, 2016. No Cuentos / Story Hour this month due to hiatus. See you September 25th at 2 PM! Libros is taking a much needed rest from August 15th to September 7th. We will reopen Sunday September 8, 2016. Libros Schmibros re-opens today, following summer hiatus. Click here to see a video from the inaugural event, plus full details & background information. MORE TO COME - check back! Go Metro to Libros Schmibros! Take the Metro Gold Line to Mariachi Plaza Station. For your best route, use the Metro Trip Planner.